Launched a new flow on Tuesday that takes our unilateral onboarding flow from >15 steps (more like 17/18) down to 4 or 5. It’s a huge step forward in user experience, removes a boatload of friction, and should lead to a nice spike in onboarding conversion. Stoked to launch it alongside the new PayPal app as a 1-2 punch for P2P-based net new actives. A new customer has to signup to claim money that an existing customer sent to their mobile number via P2P on web or mobile. 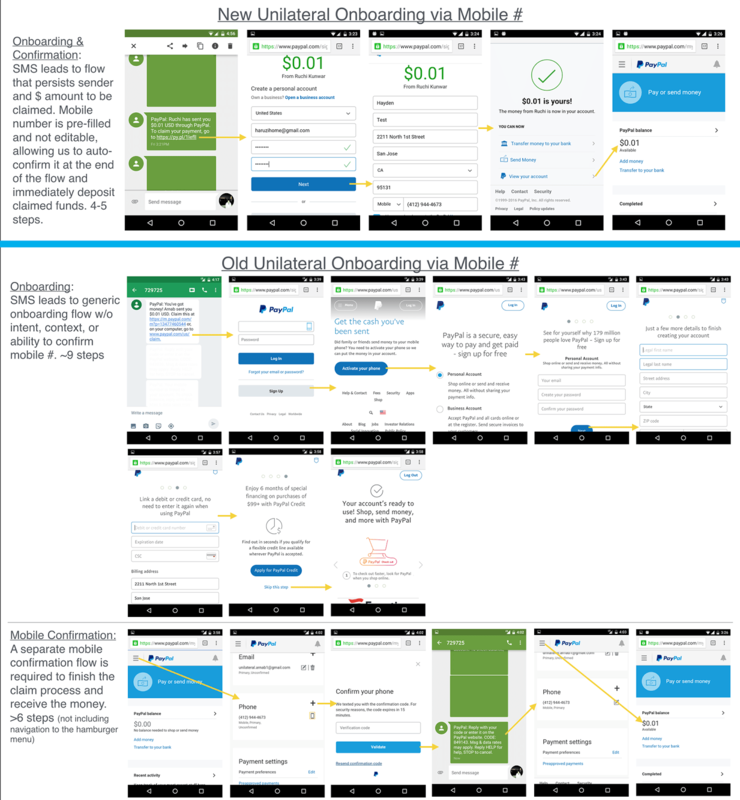 We modeled the flow after our highly successful email unilateral claim flow I launched last year, which resulted in a signup conversion increase of 1500 bps and a US claim rate increase of 58 bps. It is the closest analog we have to this new flow, so I expect to see a nice conversion spike here, as well. As of Tuesday 2/23/2016 at 1PM PST, we’re 100% live in the US, UK, FR, IT, ES, and 20% in AU and CA. This simplified experience will go a long way in supporting the increase in unilateral mobile transactions generated by the new mobile app. It was a great team effort and I need to call out Hayden Padgett from the Tesla product team, as well as Anshuman Agnihotri, Arnab Banik and Ruchi Kunwar as our go-to engineers on this project. • Cuts mobile signup from >15 steps down to 4 or 5. • Auto-confirms the recipient’s phone number at the end of the flow, removes the need for a separate confirmation flow, and results in immediate deposit of funds into the new account. • Provides a claim-money-contextual UI optimized for mobile experiences and ease-of-use. • It’s so simple, I can’t think of any more bullet points to write about it. Below screenshots feature an after/before breakdown and demonstrate the leap forward in customer experience.